Vaira Vike-Freiberga is the only serious female candidate for the European ‘ Presidency’. The procedure of selection is not democratic (it is so diffuse that it looks a lot like the way a Pope is elected! Maybe today there will be smoke:). Vaira Vike-Freiberga expressed her anger about the sexism in the European top. Yes, it seems that only males are wanted. Vaira Vike-Freiberga is the kind of person who has an extraordinary desire to be part of the old boys network, but...it is hard to succeed. The inconjunction between Sun and Uranus always mirrors the issue of NOT being regarded as ' one of us' by the wanted group. It is because with this aspect you ARE different. That is part of how she became a President in Latvia. She was a compromise candidate because she was no member of the existing political parties! That was in 1999 (when she was 62) with progressed Sun square Uranus...The issue of 'being independent' was highlighted at the time. 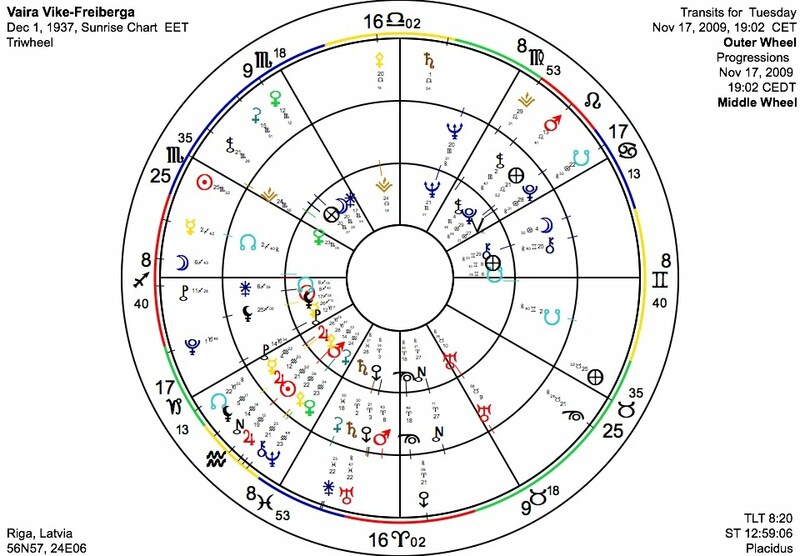 In the post ' Statue for the enemy' I mention the effect of a progressed Sun inconjunct Uranus in the chart of a German soldier who died shortly after he rescued two Dutch children during the Second World War. At the time he was a stranger (an official enemy) who wanted to be friends with the locals and who didn't feel at home among his own folks. 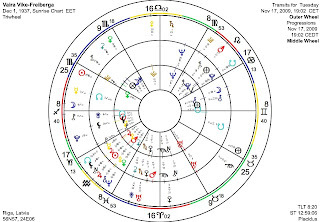 The 72 year old but still ambitious Vaira Vike-Freiberga has transit Neptune now square her natal Venus and progressed Sun inconjunct natal Neptune, the recipe for a desillusion. She would need a lot of more positive signs (perhaps related to Midheaven or Ascendant) to be the number one candidate. 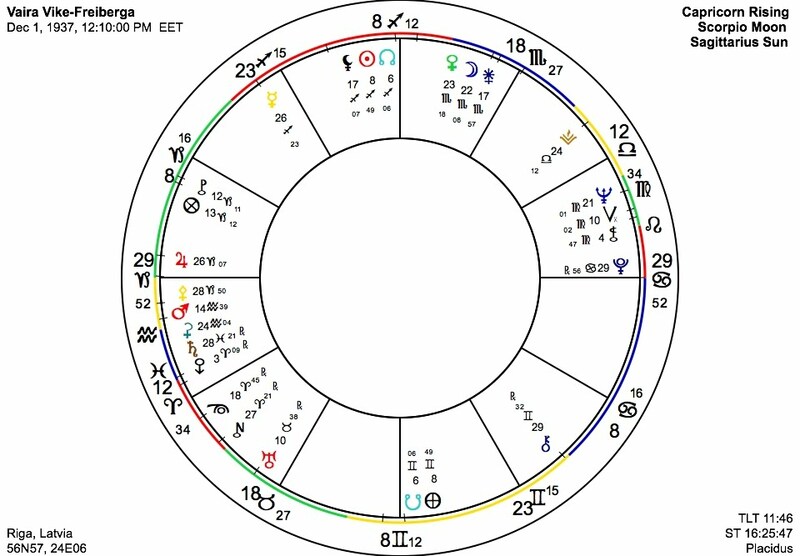 Her hour of birth is not known, so a 'miracle' (a fortunate transit of Jupiter with Midheaven?) is possible still...However, Mrs. Merkel's Uranus is sesquisquare the natal Sun of Vaira Vike-Freiberga and her Neptune is semi square that Sun. Mrs. Merkel's aproval is of vital importance. 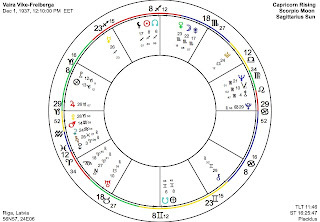 Above you see the progressed tri-wheel with a natal chart for sunrise (fictious moment of birth). (At the moment the chances for the Belgian Van Rompuy seem to be growing. He is the favorite of the French and now the German ambassador in Belgium said that Germany supports his candidacy, too. That is in line with the transit of Jupiter that is helping Van Rompuy (see the post about that, for the links, scroll down). Vaira Vike-Freiberga is an international, speaking many languages (Mercury in Sagittarius, semi sextile Jupiter, most probably on an angle). Here is her guess chart, with Pluto on Descendant opposition Jupiter on the Ascendant and the Sun on Midheaven, reflecting that she is drawing attention at any possible level (the Sun doesn’t make major aspects within 5 degrees orb). Remember, it is just a guess chart.